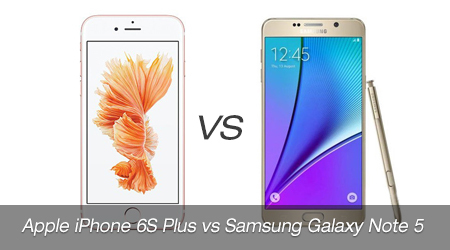 The iPhone 6s Plus and the Samsung Galaxy Note 5 are both large, attractive phablets. Now they're both here and the battle between them is likely to be fierce, with both handsets featuring a premium design, great cameras and top tier specs. They're clearly both impressive phones but to see how mind blowing they really are, we've put these two heavyweights head-to-head to see how they compare in all the key areas. On the one hand, the Samsung Galaxy Note 5 can go toe-to-toe with the iPhone 6S Plus in every area, with both phones offering a stylish design, lots of power, impressive cameras, great screens and speedy fingerprint scanners. On the other hand, although based on specs alone, the iPhone doesn't have the sharpest resolution, the highest capacity battery or the most amount of RAM, for those who are already familiar with iOS and its ecosystem will be pleased to know that the 6S Plus features a more powerful camera that captures moving "live photos," and a more advanced A9 chip processor. They're clearly two of the best phablets on the planet and with similar price tags too the real decision is whether you'd rather run iOS or Android. Both these two huge phablets are the ideal portable multimedia players. But according to the supported formats for iPhone 6S Plus and Samsung Note 5, both them have limitation on video playback. How to play any video with these two best phablets? Here, I introduce iFastime Video Converter Ultimate - a integrated and powerful software to you. This software combines the function of Blu-ray Ripper + DVD Ripper + Video Converter + Audio Extractor. Therefore, you can freely watch Blu-ray, DVD, other unsupported 4K/SD/HD videos like H.265, Tivo, etc, on iPhone 6S Plus and Note 5 with it. Considering the limit of the storage space on the phablets, this app allows you to adjust video and audio size, bitrate, etc to decide the video size as your need. It’s really a great and useful piece of info. I am glad that you shared this helpful info with us. Thanks for sharing. Hey very awesome easy to use and user friendly!